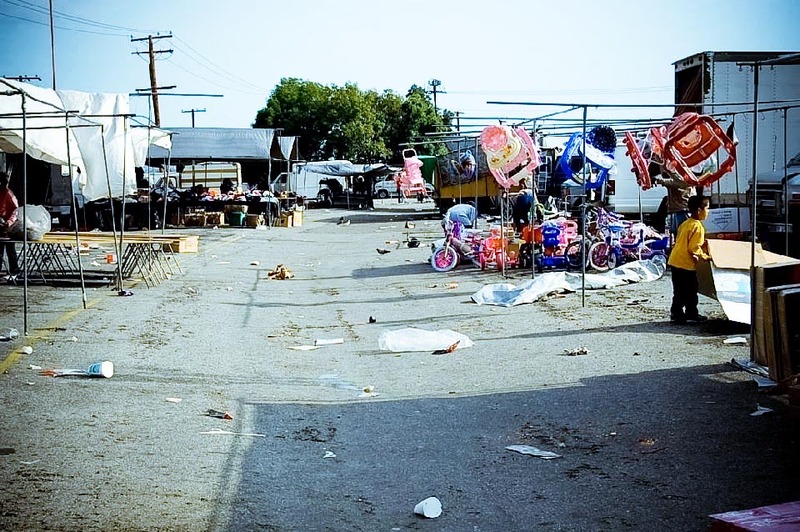 I recently had to closely revisit some research I conducted several years ago on the Starlite Swap Meet in South El Monte, CA, an industrial suburb located about a 20-minute drive east of Downtown Los Angeles. 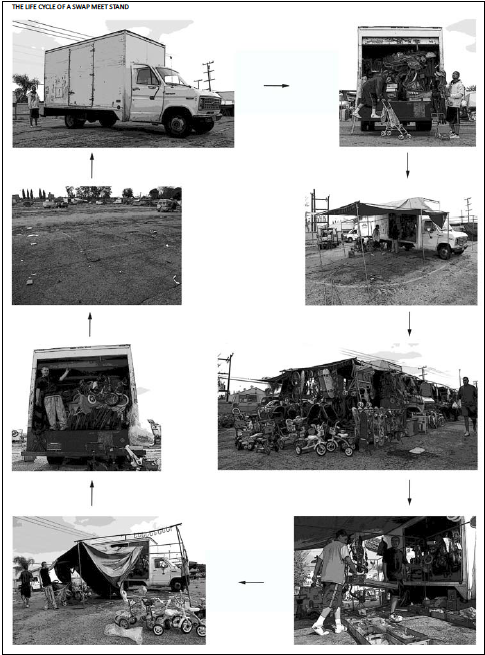 It was this research that brought me more closely to the world of informality and urban design and, given my recent post on other similar topics in Los Angeles, I thought I would include a brief review on the research from then here and now. Occupying what otherwise would be the vacant lot of a once thriving drive-in theater, the swap meet houses what can be considered a true shopping center, whose retailer variation and livelihood are perhaps nearly comparable to that of the brick and mortar establishments located in nearby neighborhoods. 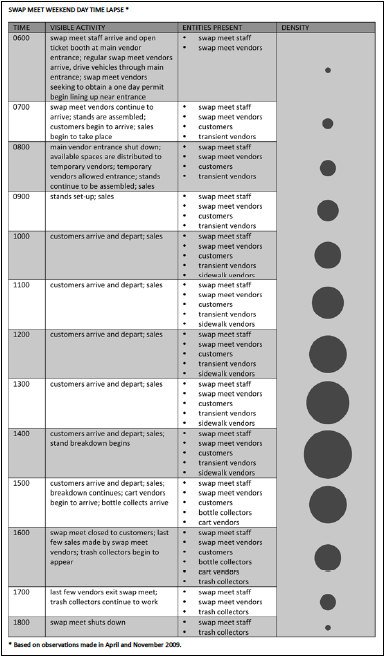 In recent years, given the economic climate, several rows, which should contain vendors’ stands, are often left vacant, but this has not stopped it from retaining a relatively strong following. Despite only being occupied on weekends, the space attracts many to its temporary “streets” and lively “public” sphere. It has continually retained such a large following that opposition from health and safety officials with legitimate and justifiable concerns has been relatively easily overcome. 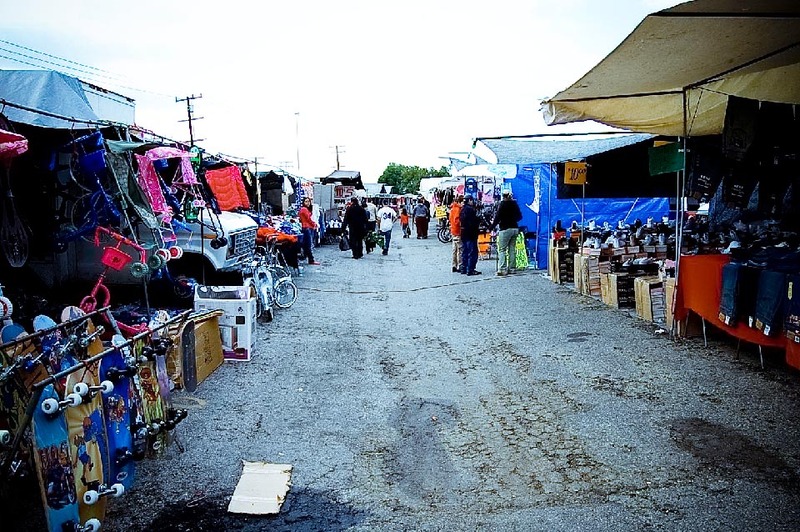 The case of the Starlite Swap Meet could be considered more paraformal, as Argentine architect Paola Salaberri and her colleagues would suggest, than informal. 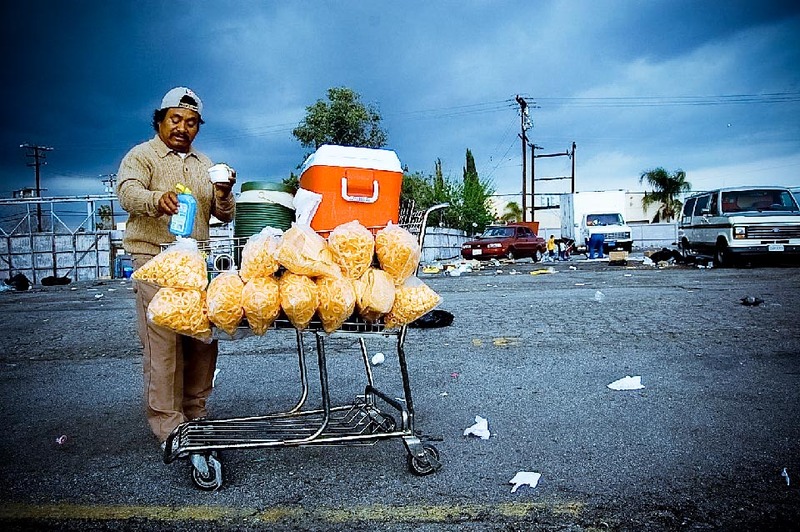 Formal activities – fees and regulations – and informal activities – transient vending and secret sales – are both at play, on top of each other and with each other. When this research was conducted in 2009, I made attempts to categorize the players involved and indicate where in the spectrum of formal to informal they stood. Some of my attempts to do this are illustrated below. 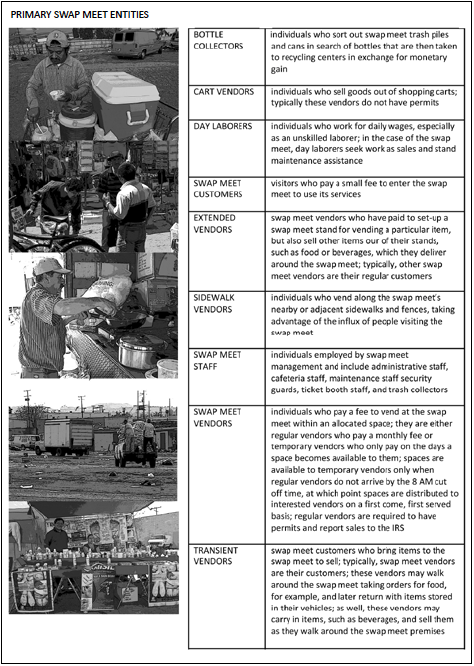 This initial research was an indication of my inclination to this kind of inquiry and, aside from also covering related Los Angeles topics, relates to what I discussed in my previous post, Edges, Patches, and Street Vendors, in which I suggested that the language of landscape ecology could inform one’s understanding of informal, organic activity. Given this blog’s ongoing discussion about what is formal and informal and whether these terms are valid descriptions, I wonder how this kind of inquiry either supports, devalues, energizes, etc. the terms of these discussions. Comments are welcome. To read more about this research and to see additional images, look here.